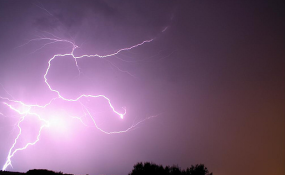 Katima Mulilo — Tragedy struck when five family members were killed by lightning at Mazongendaba in the Chinchimani area of Sibbinda Constituency, Zambezi Region, on Friday morning. The family members were struck by lightning as they were inside their house while it was raining. They all died instantly. It is understood that the house caught fire immediately when it was struck by lighting and despite that it was still raining, the house started burning. Villagers could not do anything as they watched helplessly as the housed burned to ashes with the family trapped inside. The five were identified as 45-year-old Angolan national Mateus Diveve, his 37-year-old wife Pelekelo Diveve and their three children, nine month-old baby Kadoli Diveve, Maria Diveve aged four, and Tumone Diveve (5). Diveve and his wife also left behind five more children, who were all at school when the incident happened. Zambezi regional Police Commissioner Karel Theron confirmed the incident to New Era, he also stated that their next of kin had been informed.